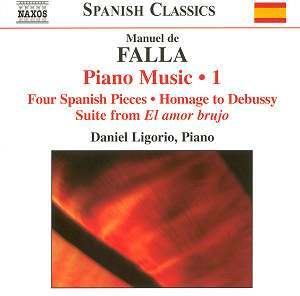 The booklet notes by pianist Daniel Ligorio, brief as they are, proudly announce that this disc marks the “first recording to be issued of Falla’s complete piano music, including juvenilia and all of his piano transcriptions”. This is an area that has been somewhat overlooked. The first volume of well selected pieces covers a wide variety of works. These here fall into three types: that is early pieces which are of much charm but little originality, secondly a longer and very fine and very Spanish work, and thirdly a transcription. Starting with the first category comes the Nocturnal, Serenata and the Serenata andaluza. These fall into the salon market category. Albeniz is not too far away, and as you might guess from the title neither is Chopin. Anyway one feels Falla finding his musical feet. The Serenata andaluza is more of a picture postcard of Spain with its swirling dotted rhythms and slightly ornamented melody oscillating between major and minor. The more typical and mature Falla is represented by the short pieces in honour of Debussy and Dukas. The Homenaje was written two years after the French composer’s death. Sobre la tumba de Paul Dukas dates from the year of Dukas’s death. There was always French quality about Falla and it comes out here. The Dukas work is especially fine with its pounding opening octaves. The Homenaje pays tribute to the Debussy who loved and indeed was so often inspired by Spain as in the piano ‘Préludes’. It got me thinking however as to why Spanish music by Spanish composers should sound Spanish at all. If Debussy could imitate Spain why not Falla imitate France or even England - sadly that never happened. Why expect Falla always to be so exotic? This thought continued whilst pondering the Allegro de Concierto, a curious work in many ways. With its opening bounding rhythm and its passionate but repetitive second theme it does not sound like the Falla we know and love. However its predominant minor key has a gypsy flavour to it. A later theme in the major key is almost Schumannesque. This piece and the two Hommages mentioned above seem to me to be brought off best of all by Ligorio. The ‘Cuatro piezas españolas’ are effectively dance pieces although they each refer to a region of Spain or places of Spanish influence: Aragonese, Cubana, Montanesa and Andaluza. The notes quite rightly mention that they are a “blend of Spanish nationalism with the sensuality of French Impressionism” which I mentioned above. The outer movements have more folkloric elements; the inner ones are sensuous and romantic. In the last category come the four movements which make up the piano transcription of ‘Love the Magician’, a quintessential Spanish score if ever there was one. This is very challenging for any pianist and I do feel that Ligorio does not make enough of the power and virtuosity inherent in the music. That coupled with too much rhythmic freedom throughout much of the CD makes it all rather a disappointment. He is not helped by a rather boxy recording, one with no air around it. The bass of the instrument suffers particularly. I cannot as yet be overly enthusiastic. Perhaps in the remaining volumes these problems may be ironed out. It’s probably best to look elsewhere at present for other collections of Falla’s piano music.